Wallace Fitzgerald Beery (April 1, 1885 – April 15, 1949) was an American film actor. He is best known for his portrayal of Bill in Min and Bill (1930) opposite Marie Dressler, as Long John Silver in Treasure Island (1934), as Pancho Villa in Viva Villa! (1934), and his titular role in The Champ (1931), for which he won the Academy Award for Best Actor. Beery appeared in some 250 films during a 36-year career. His contract with Metro-Goldwyn-Mayer stipulated in 1932 that he would be paid $1 more than any other contract player at the studio. This made Beery the highest-paid actor in the world. He was the brother of actor Noah Beery Sr. and uncle of actor Noah Beery Jr.
Min and Bill is a 1930 American Pre-Code comedy-drama film starring Marie Dressler and Wallace Beery and based on Lorna Moon's novel Dark Star, adapted by Frances Marion and Marion Jackson. The film tells the story of dockside innkeeper Min's tribulations as she tries to protect the innocence of her adopted daughter Nancy, all while loving and fighting with boozy fisherman Bill, who resides at the inn. Marie Dressler was a Canadian-American stage and screen actress, comedian, and early silent film and Depression-era film star. Successful on stage in vaudeville and comic operas, she was also successful in film. In 1914, she was in the first full-length film comedy. She won the Academy Award for Best Actress in 1931. John Silver or Long John Silver is a fictional character and the main antagonist in the novel Treasure Island (1883) by Robert Louis Stevenson. The most colourful and complex character in the book, he continues to appear in popular culture. His one-leggedness and parrot, in particular, have greatly contributed to the image of the pirate in popular culture. Hollywood Boulevard is a major east–west street in Los Angeles, California. It begins in the west as a winding residential street at Sunset Plaza Drive in the Hollywood Hills West district. After crossing Laurel Canyon Boulevard, it proceeds due east as a major thoroughfare through Hollywood, Little Armenia and Thai Town to Vermont Avenue. It then runs southeast to its eastern terminus at Sunset Boulevard in the Los Feliz district. Parts of the boulevard are popular tourist destinations, primarily the fifteen blocks between La Brea Avenue east to Gower Street where the Hollywood Walk of Fame is primarily located. Beery was born the youngest of three boys in 1885 in Clay County, Missouri, near Smithville. The Beery family left the farm in the 1890s and moved to nearby Kansas City, Missouri, where the father was a police officer. Clay County is a county located in the U.S. state of Missouri. As of the 2010 census, the county had a population of 221,939, making it the fifth-most populous county in Missouri. Its county seat is Liberty. The county was organized January 2, 1822, and named in honor of U.S. Representative Henry Clay from Kentucky, later member of the United States Senate and United States Secretary of State. Smithville is a city in Clay and Platte counties in the U.S. state of Missouri, along the Little Platte River. The population was 8,425 at the 2010 United States Census. Wallace Beery attended the Chase School in Kansas City and took piano lessons as well, but showed little love for academic matters. He ran away from home twice, the first time returning after a short time, quitting school and working in the Kansas City train yards as an engine wiper. Beery ran away from home a second time at age 16, and joined the Ringling Brothers Circus as an assistant elephant trainer. He left two years later, after being clawed by a leopard. A classification yard or marshalling yard is a railway yard found at some freight train stations, used to separate railway cars onto one of several tracks. First the cars are taken to a track, sometimes called a lead or a drill. From there the cars are sent through a series of switches called a ladder onto the classification tracks. Larger yards tend to put the lead on an artificially built hill called a hump to use the force of gravity to propel the cars through the ladder. A wiper is the most junior rate in the engine room of a ship. The role of a wiper consists of cleaning the engine spaces and machinery, and assisting the engineers as directed. The position is an apprenticeship to become an oiler. In modern times, a wiper is required to work on a ship for a specific amount of time, gaining what is referred to as "sea time." Elephants are large mammals of the family Elephantidae in the order Proboscidea. Three species are currently recognised: the African bush elephant, the African forest elephant, and the Asian elephant. Elephants are scattered throughout sub-Saharan Africa, South Asia, and Southeast Asia. Elephantidae is the only surviving family of the order Proboscidea; other, now extinct, members of the order include deinotheres, gomphotheres, mastodons, anancids and stegodontids; Elephantidae itself also contains several now extinct groups, such as the mammoths and straight-tusked elephants. 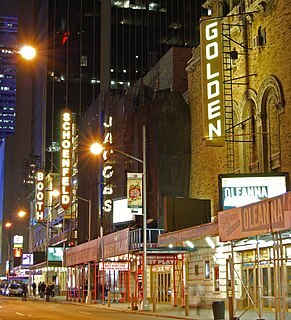 In American theater, summer stock theatre is a theatre that presents stage productions only in the summer. The name combines the season with the tradition of staging shows by a resident company, reusing stock scenery and costumes. Summer stock theatres frequently take advantage of seasonal weather by having their productions outdoors or under tents set up temporarily for their use. The Essanay Film Manufacturing Company was an American motion picture studio. The studio was founded in 1907 and based in Chicago, and later had an additional film lot in Niles Canyon, California. It is best known today for its series of Charlie Chaplin comedies of 1915. In the 1920s, after it merged with other studios, it was absorbed into Warner Brothers. His Athletic Wife is a 1913 short film starring Wallace Beery, Gertrude Forbes and Robert Bolder. This is currently believed to have been Beery's first film in his 36-year career of acting in more than 250 films. Beery was the villain in five major releases in 1920: 813 ; The Virgin of Stamboul for director Tod Browning; The Mollycoddle with Douglas Fairbanks, in which Fairbanks and Beery fistfought as they tumbled down a steep mountain; and in the non-comedic Western The Round-Up starring Roscoe Arbuckle as an obese cowboy in a well-received serious film with the tagline "Nobody loves a fat man." Beery continued his villainy cycle that year with The Last of the Mohicans , playing Magua. Beery was a villain in The Eternal Struggle (1923), a Mountie drama, which was produced by Louis B. Mayer, who would eventually become crucial to Beery's career. He was reunited with Dean and Browning in White Tiger (1923), then played the title role in the aforementioned Richard the Lion-Hearted (1923), a sequel to Robin Hood based on Sir Walter Scott's The Talisman . Irving Thalberg signed Beery to Metro-Goldwyn-Mayer as a character actor. The association began well when Beery played the savage convict "Butch," a role originally intended for Lon Chaney Sr. (who died that same year), in the highly successful 1930 prison film The Big House , directed by George W. Hill; Beery was nominated for the Academy Award for Best Actor. Back at MGM he played the title role of Pancho Villa in Viva Villa! (1933) and was reunited with Dressler in Tugboat Annie (1933), a massive hit. He was Long John Silver in Treasure Island (1934), described as a box office "disappointment"  despite being MGM's third largest hit of the season, and remains currently viewed as featuring one of Beery's iconic performances. On August 4, 1924, Beery married actress Rita Gilman (née Mary Areta Gilman; 1898–1986) in Los Angeles. The couple adopted Carol Ann Priester (1930–2013), daughter of Rita Beery's mother's half-sister, Juanita Priester (née Caplinger; 1899–1931) and her husband, Erwin William Priester (1897–1969). After 14 years of marriage, Rita filed for divorce on May 1, 1939, in Carson City, Ormsby County, Nevada. Within 20 minutes of filing, she won the decree. Rita remarried 15 days later, on May 16, 1939, to Jessen Albert D. Foyt (1907–1945), filing her marriage license with the same county clerk in Carson City. On February 13, 1948, Gloria Schumm (aka Gloria Smith Beery, née Florence W. Smith; 1916–1989) filed a paternity suit against Beery. Beery, through his lawyer, Norman Ronald Tyre (1910–2002), initially offered $6,000 as a settlement, but denied being the father. Gloria had given birth on February 7, 1948, to Johan Richard Wallace Schumm. Gloria, in 1924, divorced Stuttgart-born Hollywood actor Hans Schumm (né Johann Josef Eugen Schumm; 1896–1990), but remarried him August 21, 1947, after realizing that she was pregnant. Prior to remarrying Hans Schumm, Gloria, on August 4, 1947, met with Beery at his home, where he gave her the name and address of a physician to submit an examination. At or around that time, she also asked Beery to marry her to legitimatize the expected child (her words), which Beery refused. 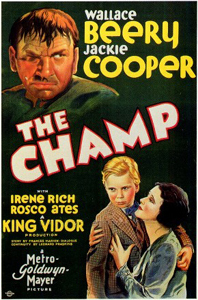 The Champ is a 1931 American pre-Code film starring Wallace Beery and Jackie Cooper and directed by King Vidor from a screenplay by Frances Marion, Leonard Praskins and Wanda Tuchock. The picture tells the story of a washed-up alcoholic boxer (Beery) attempting to put his life back together for the sake of his young son (Cooper). Lionel Barrymore was an American actor of stage, screen and radio as well as a film director. He won an Academy Award for Best Actor for his performance in A Free Soul (1931), and remains best known to modern audiences for the role of villainous Mr. Potter in Frank Capra's 1946 film It's a Wonderful Life. John Cooper Jr. was an American actor, television director, producer and executive. He was a child actor who made the transition to an adult career. Cooper was the first child actor to receive an Oscar nomination. 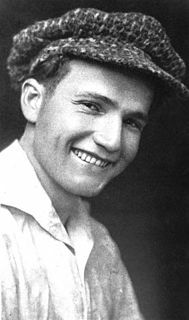 At age nine, he was also the youngest performer to have been nominated for an Academy Award for Best Actor in a Leading Role, an honor that he received for the film Skippy (1931). For nearly 50 years, Cooper remained the youngest Oscar nominee in any category, until he was surpassed by Justin Henry, who was nominated at age eight for Best Supporting Actor for Kramer vs. Kramer (1979). Gloria May Josephine Swanson was an American actress and producer. She achieved widespread critical acclaim and recognition for her role as Norma Desmond, a reclusive silent film star, in the critically acclaimed 1950 film Sunset Boulevard. The film earned her an Academy Award nomination and a Golden Globe Award win. The following is an overview of 1931 in film, including significant events, a list of films released and notable births and deaths. The House That Shadows Built (1931) is a feature compilation film from Paramount Pictures, made to celebrate the 20th anniversary of the studio's founding in 1912. The film was a promotional film for exhibitors and never had a regular theatrical release. Noah Nicholas Beery was an American actor who appeared in films from 1913 to 1945. He was the older brother of Academy Award-winning actor Wallace Beery and the father of character actor Noah Beery Jr. Beery was billed as either Noah Beery or Noah Beery Sr. depending upon the film. Noah Lindsey Beery, known professionally as Noah Beery Jr. or just Noah Beery, was an American actor specializing in warm, friendly character roles similar to the ones played by his paternal uncle, Wallace Beery, although Noah Beery Jr., unlike his more famous uncle, seldom broke away from playing supporting roles. His father, Noah Nicholas Beery, enjoyed a similarly lengthy film career as a major supporting actor. Beery Jr. was best known for playing James Garner's character's father, "Rocky" in the NBC television series The Rockford Files (1974–80). The 4th Academy Awards were awarded to films completed and screened released between August 1, 1930, and July 31, 1931, by the Academy of Motion Picture Arts and Sciences. At the ceremony, nine-year-old Jackie Cooper, nominated for Best Actor in Skippy, fell asleep on the shoulder of Best Actress nominee Marie Dressler. When Dressler was announced as the winner, Cooper had to be eased onto his mother’s lap. Tom Forman was an American motion picture actor, director, writer, and producer of the early 1920s. Treasure Island is a 1934 film directed by Victor Fleming and starring Wallace Beery, Jackie Cooper, Lionel Barrymore, Lewis Stone, and Nigel Bruce. It is an adaptation of Robert Louis Stevenson’s famous 1883 novel of the same name. Jim Hawkins discovers a treasure map and travels on a sailing ship to a remote island, but pirates led by Long John Silver threaten to take away the honest seafarers’ riches and lives. Tugboat Annie is a 1933 American pre-Code film directed by Mervyn LeRoy, written by Norman Reilly Raine and Zelda Sears, and starring Marie Dressler and Wallace Beery as a comically quarrelsome middle-aged couple who operate a tugboat. Dressler and Beery were MGM's most popular screen team at that time, having recently made the bittersweet Min and Bill (1930) together, for which Dressler won the Academy Award for Best Actress. 20 Mule Team is a 1940 American Western film about Death Valley, and Daggett, California borax miners, directed by Richard Thorpe and starring Wallace Beery, Marjorie Rambeau and Anne Baxter. The film provides an extremely rare opportunity to see Beery act opposite his nephew Noah Beery Jr., best known for playing Joseph "Rocky" Rockford on television's The Rockford Files during the 1970s. The film was originally released in Sepiatone, a brown and white process used by the studio the previous year for the Kansas scenes in The Wizard of Oz. The Thundering Herd is a lost 1925 American Western lost film directed by William K. Howard, and starring Jack Holt, Lois Wilson, Noah Beery, Sr. and Raymond Hatton. Based on Zane Grey's 1925 novel of the same name and written by Lucien Hubbard, the film is about a trader who uncovers a scheme to blame the Indians for a Buffalo massacre. Albert Edward Sutherland was a film director and actor. Born in London, he was from a theatrical family. His father, Al Sutherland, was a theatre manager and producer and his mother, Julie Ring, was a vaudeville performer. He was a nephew of both Blanche Ring and Thomas Meighan, who was married to Frances Ring, another of his mother's sisters. Ah, Wilderness! is a 1935 American film adaptation of the Eugene O'Neill play of the same name starring Wallace Beery. The picture was shot in Grafton, Massachusetts, at the common in the center of town, and was directed by Clarence Brown. 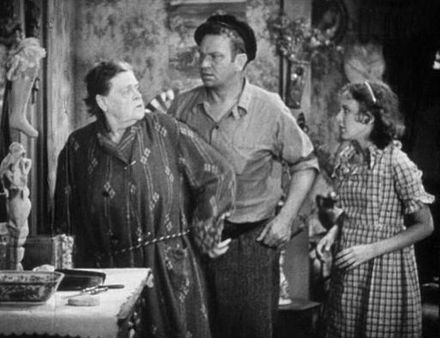 Beery plays the drunken uncle later portrayed on Broadway by Jackie Gleason, and the film features Lionel Barrymore, Eric Linden, Cecilia Parker, Spring Byington, and a young Mickey Rooney. Rooney also stars in MGM's musical remake Summer Holiday (1948). Sweedie Goes to College is a 1915 silent comedy film directed by Richard Foster Baker and featuring Gloria Swanson. Lorna Moon was a Scottish author and screenwriter from the early days of Hollywood. She is best known as the author of the bestselling novel Dark Star (1929) and as one of the earliest and most successful female screenwriters. As a screenwriter, she developed screenplays for notables including Gloria Swanson, Norma Shearer, Lionel Barrymore and Greta Garbo. ↑ Obituary Variety , April 20, 1949. 1 2 Dictionary of Missouri Biography, Lawrence O. Christensen, University of Missouri Press, 1999. 1 2 Sonneborn, Liz (2014-05-14). A to Z of American Women in the Performing Arts. Infobase Publishing (published 2002). ISBN 9781438107905. OCLC 297504194. ↑ History of the Academy Awards: The Fifth Academy Awards, 1931/32. About.com archive. Retrieved April 2, 2015. ↑ THE YEAR IN HOLLYWOOD: 1984 May Be Remembered as the Beginning of the Sweetness-and-Light Era By DOUGLAS W. CHURCHILL.HOLLYWOOD.. New York Times (1923-Current file) [New York, N.Y] 30 Dec 1934: X5. 1 2 Shearer, Stephen Michael (2013). Gloria Swanson: The Ultimate Star. Thomas Dunne Books. ISBN 9781250013668. ↑ Swanson, Gloria (1980). Swanson on Swanson. Random House. pp. 69–75. ISBN 0-394-50662-6. ↑ Katchmer, George A. (2002-05-08). A Biographical Dictionary of Silent Film Western Actors and Actresses. McFarland. ISBN 9781476609058. ↑ Rooney, M. Life is Too Short. Villard Books (1991), p. 77. ISBN 0679401954. ↑ Bergan, R (May 5, 2011). Jackie Cooper Obituary. The Guardian archive. Retrieved August 20, 2012. ↑ Rooney, M. Life is Too Short. Villard Books (1991), pp. 76–7. ISBN 0679401954. ↑ Marx, A. The Nine Lives of Mickey Rooney. Stein and Day (1986), p. 68. ISBN 0812830563. ↑ Heiser, Wayne H., "U.S. Naval and Marine Corps Reserve Aviation V. I, 1916–1942." p.78. ↑ Rooney, M. Life is Too Short. Villard Books (1991), p. 239. ISBN 0679401954. ↑ Rafferty, Terrence (July 27, 2003). "FILM; He's Nobody Important, Really. Just a Movie Writer". The New York Times . Wikimedia Commons has media related to Wallace Beery .